So one of the consequences of there being very few nonstop flights back to Austin is that I can usually have a stopover on the east coast without paying much extra. I take advantage of this on my way home for the holidays, so three days in NYC were quickly booked in to see some of my favorite people in the world. Y&A live in New Jersey now but still work in NYC, so we managed to schedule a Friday night dinner just a few hours after my plane landed, and my friend O was able to join as well. This is where my story takes a dark and unexpected turn. I got sick on the plane. Really sick. I'm not going to get into graphic descriptions, but let's just say I was not able to eat dinner, really. 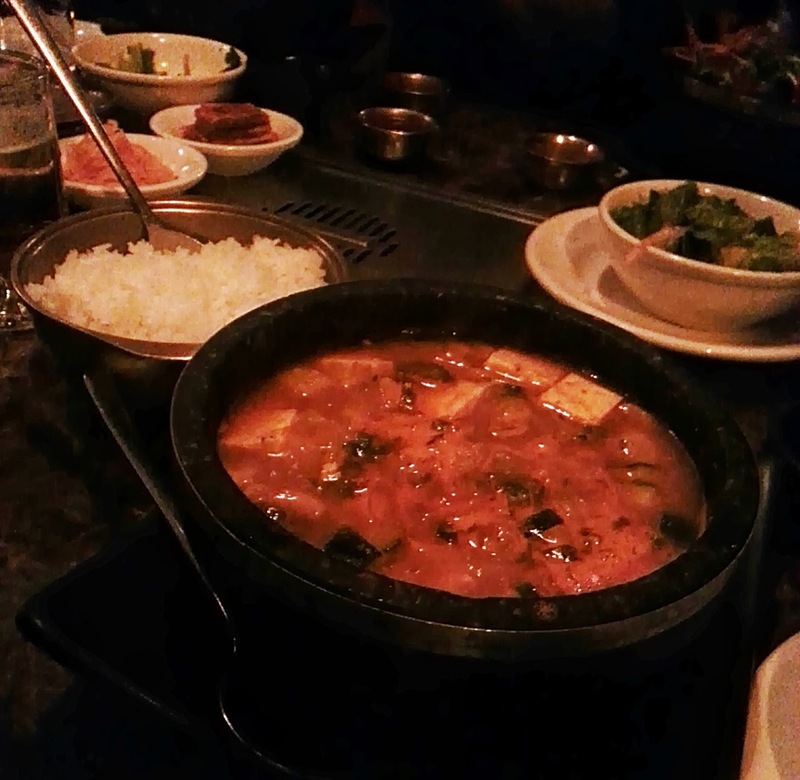 Which was a shame as Y&A had picked a Korean restaurant (Bann) because I had told them I was craving Korean. Above, you see the delicious tofu stew I ordered. I took two bites. They were delicious, and I was so sad that I wasn't feeling like scarfing the entire bowl, plus the amazing looking seafood pancake that Y&A ordered, plus the banchan on the table. Thankfully, I was in the US, where you can have anything packaged up neatly to take home, and I did manage to eat it a couple of days later when I had recovered a bit, and it was good, but I bet it would have been better if I had gotten to eat it when I ordered it.